Project: As data stewards for the Oregon Lidar Consortium, DOGAMI provides quality assurance/quality control steps to ensure the lidar and imagery data standards for the program are met. DOGAMI receives several lidar and imagery datasets for each project from the vendor that are reviewed for adherence to OLC lidar data specifications and standards. These data and products include .las datasets, lidar-derived digital elevation and digital terrain models, intensity images, and orthophotography. The data are reviewed using several different methods. 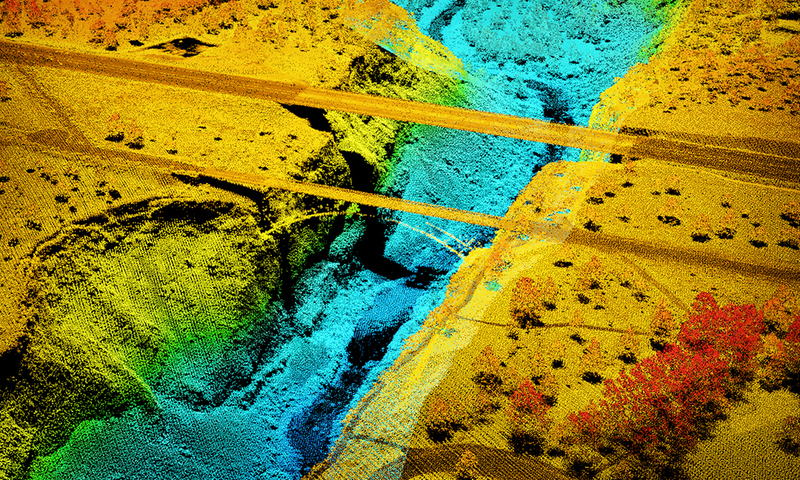 Lidar data is visually reviewed and checked for data anomalies such as errant or mis-classified points and imagery is checked for warping and mosaicking errors. Lidar vertical and horizontal accuracy are compared and cross-referenced with independently collected ground points and .las files are checked for proper data density and flight line overlap. Last-return datasets (bare-earth) are compared to all-return (highest-hit) datasets in order to ensure proper removal of structures and vegetation. Above: An all-return (highest-hit) point cloud image (.las dataset) of the Crooked River Gorge in central Oregon classified by elevation. Above – Mount Tabor in Portland, Oregon. 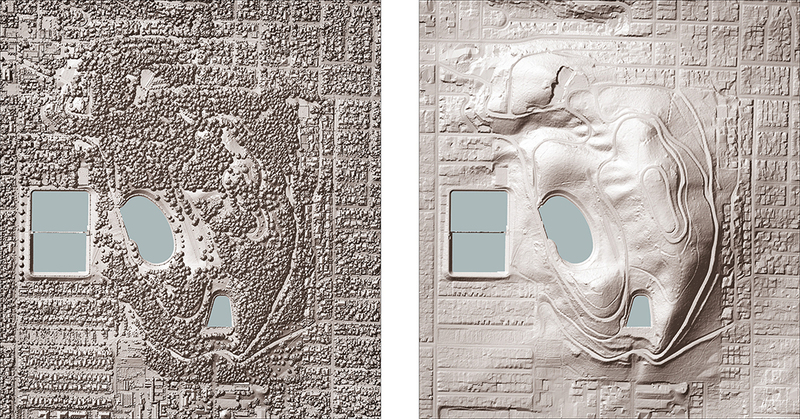 (Left) An all-return (highest-hit) shaded-relief image and (Right) a last-return (bare-earth) shaded-relief image with all vegetation and structures removed.